A full house at Parkhead enjoyed an afternoon in the sunshine watching a sentimental kick-about between Motherwell and Celtic legends. 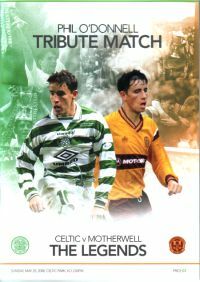 They came together to pay tribute to Phil O'Donnell and to celebrate the part he played for both teams. There was a sizeable Motherwell contingent in the stadium to welcome many of the 1991 cup winning team as they lined up against a younger opposition representing the Celtic 1998 league champions. 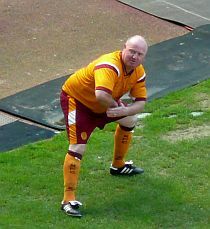 Some of their strips were of the XL variety but many of the favourites were easily recognisable from their running (or shuffling) style.We lined up with Woods, McKinnon, McCart, Paterson, Angus, Niholt, Ferguson, Griffin, Clarkson (wearing Phil's number 10), McFadden (in Cooper's 11) and Arnott. 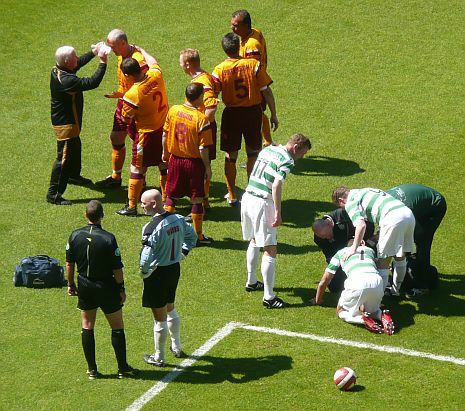 It was clear from the kick off that the younger Celts were going to dominate the game and so it remained for both halves.McCart and Larsson had to leave the field for treatment after a couple of minutes after a clash of heads but they were both to return later. 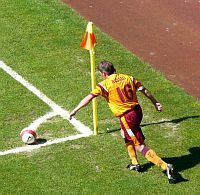 Both squads made free with substitutions and we were to see appearances from Leitch, Dolan, Coyne, Russell, Dykstra, Kirk, Martin, Wishart and O'Neill.Stephen O'Donnell had a spell in the claret and amber and Tom Boyd managed to play for both teams. At half time there was a video compilation of Phil and also one of Tommy Burns.Members of the O'Donnell family made the half time draw. David Clarkson managed to score in the second half with the help of a favourable offside decision.The final score was 5-1 but that was the last thing on the minds of the players as they all met in the centre circle at the end of the game.They had all played their part in Phil's memory. Celtic took the opportunity to show the SPL trophy to their fans after the game had finished and the 'Well supporters took the chance of avoiding the post match congestion by leaving them to it.